﻿ Grenada 17 prisoners, leaders of the coup against Maurice Bishop. Grenada 17 prisoners, leaders of the coup against Maurice Bishop. 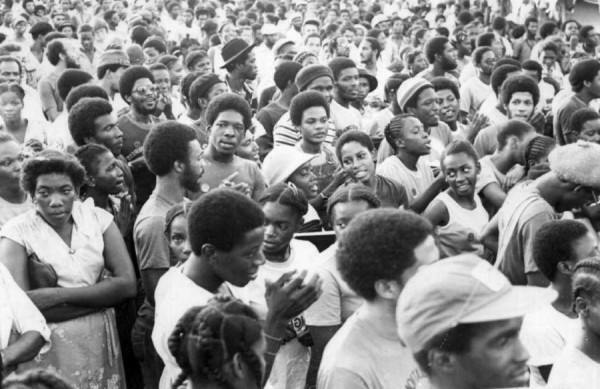 The Grenada 17 were imprisoned when the Grenada revolution was ended. The New Jewel Party was divided and Bernard Coard led a coup against Maurice Bishop. The Grenada 17, convicted doup leaders. For a better undertanding you should first read the following pages. They were accused of murdering Prime Minister, Maurice Bishop, and others. The seventeen have always maintained their innocence in relation to the charges brought against them and there are many that question the fairness of their trial. Several people have campaigned on their behalf worldwide and a pamphlet by Richard Hart, The Grenada Trial: A Travesty of Justice, gives details of the trial process. The Grenada 17 are: Bernard Coard, Selwyn Strachan, General Hudson Austin, Ewart Layne, Liam James, Leon Cornwall, Dave Bartholomew, John Ventour, Phyllis Coard, Colville McBarnette, Christopher Stroude, Lester Redhead, Calistus Bernard, Cecil Prime, Andy Mitchell, Vincent Joseph, and Cosmos Richardson. Over the years many individuals and organisations have donated money and other resources to assist with such matters as; defending the trial of the 17, paying tuition and exam fees for those studying to improve their education, purchasing books, computers and other educational materials to assist with the prison education programme. If you wish to make a donation of money (or some other resource) towards the campaign for justice for the 17, then please write to The Committee for Human Rights in Grenada (UK) also known as the CHRG (UK), 83A High Street, Harlsden, London, NW10 4NT, ENGLAND. If you wish to send a cheque please make it payable to CHRG. The prisoners in Grenada Bernard Coard, a Grenadian, his Jamaican wife Phyllis and 15 other former government ministers and members of the military have been in prison in Grenada since the United States invasion of the island in 1983. They were part of the left-wing government that was established after a revolution in 1979 that ousted Eric Gairy. This government achieved much for the health, education and literacy of the Grenadian people, as also for the status of women and the welfare of pre-school children. Tragically, disagreements within the government led to an affray in October 1983 in which the Prime Minister, Maurice Bishop, and several others were killed. This was the excuse for the invasion ordered by U.S. President Reagan, which led to mass arrests of New Jewel Movement members. Among those detained were Bernard and Phyllis Coard. Bernard, Phyllis and 15 others (who have become known internationally as the “Grenada 17”) were tried in 1986 for their alleged part in Bishop’s death, and found guilty of murder. Twelve of them, including the Coards, were sentenced to death and the others to life imprisonment. The trial is widely regarded as having been hopelessly biased and legally flawed, for instance, through improper jury selection procedures and failure to admit medical evidence of the use of torture during interrogation. Nonetheless, the Grenada Court of Appeal in 1991 rejected the Grenada 17’s appeal; today, after 8 years, the judges have still not produced a written statement of their judgment. Immediately following the 1991 verdict, Bernard Coard and four others were about to be executed, but an international outcry led to a postponement, and then to the commuting of the death sentences to life imprisonment. However, the Grenada 17 were, by special legislation, deprived of the right to appeal to the Privy Council. This denial of a right now available to all other Grenadian citizens constitutes discrimination of a clearly political nature, all the more so since Grenada has no internal parole system. The 17 could therefore only be released by a decision of the government of Grenada. The 17 have now served over 20 years in prison, and would under most systems, regardless of their guilt or innocence, have by now been due for remission. As things stand, they could well remain in prison for the rest of their lives. Their behaviour in prison has been exemplary. Bernard has led a programme of education for many of the 300 inmates of Richmond Hill Prison: a large number have achieved A-level or technical qualifications, and a few have obtained university degrees. Inadequate medical facilities affect Phyllis Coard, who as the only woman political prisoner spent the best part of six years in virtual solitary confinement and now suffers from post traumatic stress disorder, clinical depression and anxiety. The 16 male prisoners also suffer various health ailments, of which, Kamau McBarnette’s prostate condition is the most serious. Their release is warranted on compassionate grounds, quite apart from the injustice of the situation in which all 17 prisoners are placed. Bernard and his fellow prisoners have issued an apology for the misjudgement of their government, which led to the tragedy of October 1983. They have accepted political and moral responsibility for the tragedy. While reiterating their innocence of the charge of murder, they have expressed their sincere regrets to those whose family or friends were killed in the affray. They have also stated that none of the prisoners, if released, would again engage in any political activities. The massive US propaganda campaign waged in Grenada right after the invasion explicitly targeted Bernard Coard (e.g. large posters declaring him to have betrayed his country, museum displays naming him as a murderer before the conclusion of his trial); the Grenada 17 do not have the means to conduct a counter-campaign. Whilst some Grenadians are hostile to the release of the 17, there is support for them in some quarters; one of the 3 weekly newspapers in Grenada has consistently called for their release in recent years, and another has published material sympathetic to them.